What I consider the Central Oregon coast and what locals might consider it may in fact be slightly two different regions, though I’m sure there’s a lot of overlap. What we can probably agree on is that the cities of Lincoln City, Depoe Bay, Newport, Waldport, Yachats and Forence would be considered on the central coast. I’ve spent most of my time in the stretch around Newport as my parents, until just recently, had a summer home there. Both of my two major photo trips to Oregon have included several days in Newport and the stretch within an hour or two drive of there. And in that stretch there is a lot to take in, experience, photograph or just enjoy. In my last segment of The PNW Chronicles I stated that all roads lead to Cannon Beach. And that’s true, if your destination is the northern Oregon coast. Getting to the central Oregon coast has a few more options depending on where you’re starting from. If you start your trip in Seattle, and have any sense at all, you’ll get to the coast long before Lincoln City, but if you’re in a hurry to get to locations such as Thor’s Well, Yaquina Head or elsewhere to the south, taking I-5 through Portland and then south west through McMinnville and on into Lincoln City is probably your fastest route. (Side note – do be tempted to make a stop in the McMinnville area for either a bottle of wine or a stop at the Evergreen Aviation Museum, but that’s a topic for a future post). 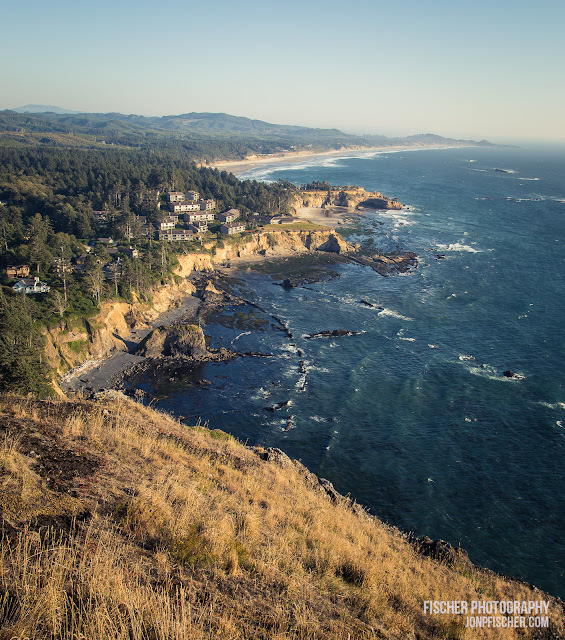 A better option if you have been reading the previous posts and planning your route down the coast on the 101 is to simply pick up where you left off on the north Oregon coast and continue your exploration of the ever changing coastline. Especially since this leads your right into a town that, sadly, to date, I have not had the opportunity to visit beyond passing through – Tillamook. If you have been inside a market nearly anywhere in the western half country you’ve likely seen the name of this town stamped across the front of a block of sharp cheddar cheese or carton of ice cream. And now, in case you were still wondering, you know where the name comes from. One day, hopefully on my next visit to the region, I won’t spend all my spare time taking one more photo of the the ocean and have a few minutes to spend taking a tour at the Tillamook cheese factory on my way through town. I highly suggest you don’t make that misjudgment in time and ensure you have time to make that stop. One of the larger towns along the central Oregon coast, Lincoln City is a decent place to set down roots for a day or two for exploring up and down the coast. Highway 18 intersects with the 101 just north of town, and 229 “Siletz Highway” cuts back inland just south of town following the Siletz River with several park and recreational areas to explore. 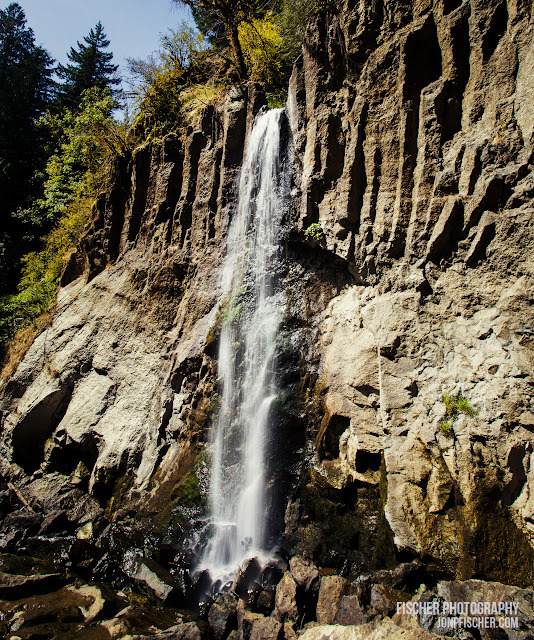 Also near by is Drift Creek Falls, a nice 3 mile hike to a beautiful waterfall that includes a large foot suspension bridge as you reach the waterfall. I did this hike during my 2014 trip, and while I thoroughly enjoyed the hike, a nice change of pace from the coastal views, the number of people on a warm weekend afternoon prevented me from really exploring the photographic opportunities as much as I would have liked. Depot Bay is known as the ‘Worlds Smallest Harbor’, blink more than twice as you cross over the bridge and you’ll likely miss it completely. While there are a couple small parks within the small town, there’s not a lot of good photographic spots that are easily (or possibly legally) accessible. Instead, continue down the coast just a bit further till you reach Rocky Creek State Scenic Viewpoint. Here you will have a great view of Whale Cove Habitat Refuge to the north – I shouldn’t have to mention what you’ll have a chance to see here – in addition to lots of possible compositions for long exposure photography as the ocean crashes on the rocky coastal cliffs. Plan to spend an easy 30 minutes or longer here, the options even in ‘good weather during the day’ are too numerous to count. Pulling yourself away from Rocky Creek, don’t miss the entrance to the Otter Crest Loop, something like a 10th of a mile down the road (seriously, don’t even get up to speed once you’re on the 101, the exit onto the loop is a bit of a drop off and comes up very quickly). The loop holds several view points and attractions well worth your time. Almost immediately after turning onto the loop road, you’ll cross over one of the beautiful historic bridges that are iconic of the entire west coast. While this one isn’t nearly as grand in scale as many of the others, it does make for a nice photographic element, especially on moody foggy days. From the north side of the bridge, you might be lucky enough to see a seasonal waterfall cascading down into the ocean on the opposite side of the inlet which the bridge spans. The better view point of the bridge is from the south side of the inlet looking back at the bridge against the hillside. Back on the road headed south, you will next see signs for Cape Foulweather and Otter Crest State Wayside. A beautiful view point down to the south, on good days you’ll see all the way down to Yaquina Head Lighthouse and beyond. Keep a keen eye open for whales and other marine life just off the coast. There is also a small gift shop and great information about the history of this section of the Oregon coast. Continuing down the 1-way road, you’ll want to make a stop at Devil’s Punchbowl. Parking can be at a premium here, so grab the first spot you see. A low tide you can get down into the open top cavern, but do NOT linger long. Depending on the tide, you can have as little as 15 minutes of time to get out before the water gets high enough for a wet exit – or no exit. At high tides, you’ll have excellent views from up to as waves crash into the cavern, very quickly understanding how the formation got its name and why lingering down below is not advisable. Follow the paved walk ways around to the south for more wonderful views down the coastline towards Newport. Standing as a beacon, quite literally, high above the cliffs of Yaquina Head is the tallest light house on the Oregon coast. Used for decades as a navigation aid to sailors as they traveled the waters near the Yaquina Bay and Newport Harbor, today Yaquina Head Lighthouse and the tide pools around Cobble Beach are one of the must stop locations along the central Oregon coast. Be prepared for almost any weather here, the high bluffs surrounding the lighthouse can easily generate winds in excess of 40 mph or more, I’ve been up there in winds that were probably pushing 60 mph. Taking the stairs down the side of the cliff to Cobble Beach usually provides a great deal of protection from the elements, though attempting to walk on the polished rocks making up the beach provides a different sort of workout. Leaving Yaquina Head you will next enter into the town of Newport. Attractions and photo opportunities are almost too many to count here, possibly because it’s an area I’ve spent significant time in and know it more than some of the other stretches of coast, but also because there really is a plethora of things to see and do. Starting from the north along the coast you have Agate Beach, Nye Beach, Don Davis Park, Yaquina Bay State Recreation Area (along with another lighthouse and the north jetty), Yaquina Bay Bridge, hopping to the south side of the bay you’ll find the South Jetty State Park, South Beach State Park, and Lost Creek State Park before you leave the immediate Newport vicinity. If that wasn’t enough, there are a number of small lakes just inland to explore, the entire bay with Newport Harbor, Hatfield marine Science Center, the Oregon Coast Aquarium, Rogue Ales brewery, just to name a few options. The Aquarium is well worth checking out, and if for no other reason than some amazing seafood, take a stroll along the Harbor’s waterfront. Photographing the bay and the bridge is best done in the mornings or evening at high tides, morning has a better chance at some moody fog that goes very well with the style and look of the arching bridge. Fishing boats entering or exiting the bay also make great subjects in the early morning hours as the light is softened by the damp marine layer. Back up at Agate Beach, don’t be fooled by the name, it’s nothing like Cobble Beach up at Yaquina Head. The sand here is extremely fine and once the wind picks up it will find its way into nearly anything and everything. You would be wise to consider throwing a rain sleeve around your camera out here, and I’d advise against changing lenses. My final two coastal locations worth checking out further south from Newport are Seal Rock and Thor’s Well. Seal Rock State Recreation Area is a fairly short drive south of Newport and well worth a stop for a nice beach with amazing rock formations just off the beach. There are plenty of amazing compositions here, and while I’ve never had that “perfect” shot from this spot, it’s a place I would not hesitate to revisit in future trips. And then, last, but absolutely not least, and the reward for reading this far down into this article – Thor’s Well at Cape Perpetua. You’ll think you’re passing up quite a bit on the drive down from Newport, through Waldport (which has a nice little bridge, but I prefer Newport’s), and you probably are, they can be seen on the drive back to Newport if you’re staying there for the night. Thor’s Well is the cherry on top of a 40 or so minute drive down the coast. First, get there at around high tide. Second, be prepared to get you and your camera wet to get the most iconic shots. Thor’s Well is known as The Money Pit by photographers. My last visit, and high tide, at sunset, was quite the experience. The surf was up and while my group managed to stay on their feet and gear in hand, another visitor did take a fall that resulted in a wet camera. Though it is possible to get some different and equally beautiful shots of the well by standing back up the hill a little ways and using a longer lens such as a 70-200. The central Oregon coast has been a second home for my parents for the last seven summers and I’ve been thankful to be able to visit them and this amazing region several times over those years. I have experienced nearly every sort of weather that the spring and summer months of the state can throw at you, and I’d be lying if I didn’t consider trying to fly up there during the winter at some point to experience the Oregon coast at her most vicious and raw state. This past trip, I tried to take everything I had learned and experienced in previous trips and target the best locations possible for each sunset and sunrise we had in the area. Driving in from the northern Oregon coast, my group reached Newport in late afternoon. Being June we had sunlight well into the evening hours, sunset was not until nearly 9pm. We timed our arrival so that high tide would be at around 8:30, the tide slowly going out as we reached our first sunset destination – Thor’s Well. Any google search of the location will turn up dozens of jaw dropping shots of amazing sunsets on the edge of the churning sea. We wanted the same, but we also didn’t want to be surprised by ever increasing tides. So we arrived just on the back side of high tide, and while the sea was more than cooperative, the skies were not. The curse of the flat empty skies bit, and bit hard. We did our best, but in the end the light just wasn’t what we wanted, and the best shots were those that focused far more on the well than the horizon. All was not lost however, the clear empty skies that was a curse at sunset became a blessing after the sun was gone and the stars came out. A drive up to Cape Disappointment yielded shots of the Milky Way rising over the coast and stretching down towards the ocean waves. The following day was spent on the north side of Newport, Rocky Creek Viewpoint and along Otters Crest Loop. While the skies had a little more interest than the day before, at least during the day light hours, it was a prime example of why most landscape shots are taken during the ‘Golden’ and ‘Blue’ hours of the day. And oh what golden, or should I say fiery final hour of the day it was. Deciding to stay closer to Newport for our second and final night in town, we drove up to Yaquina Head Lighthouse for the sunset. The day-use only park officially closes at sunset, but they don’t kick you out till you at least get the peak light. As we stood there, almost too awestruck to remember to take photos, even the locals around us were commenting how rare this quality of sunset was. It more than made up for our flat sunset the night before. Yaquina Head Gold – and orange, and red, and purple. Our time on the coast drew to an end on Sunday, however one look at the temperature forecast further inland gave us all the excuse we needed cling to the cooler temps as long as possible. Revisiting a few locations such as Thor’s Well for a second time some of the group who were still getting over the learning curve of coastal long exposure shots a little time to put into practice what they had figured out as well as finding a few new spots to explore. As the day drew to a close, the skies told us there would be no repeat of the fiery sunset we had enjoyed the night before. So opting to take a moment to reflect on our time on the coast we headed for Ona Restaurant in Yachats just north of Thor’s Well for an amazing dinner. If you ever get the chance to visit the region and have an excuse to stop – get the crab cakes. You won’t be disappointed. Actually, you won’t be disappointed in anything, but remember the crab cakes.